Woman on bicycle. That's a thick shawl she's wearing. Must've been winter. It's unusual to see a bicycle used as a studio prop. 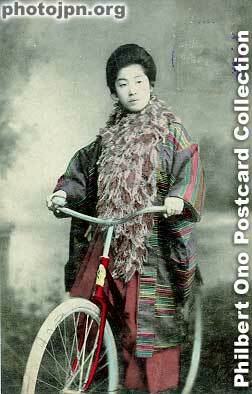 Riding a bicycle while wearing a kimono must have been difficult. The postmark looks like 1908. Hand-colored. Possibly this was taken at graduation from school. Hakama were (and currently still are) used in graduation photos.